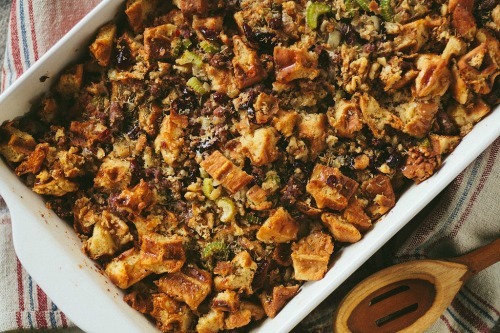 10 Thanksgiving Stuffing Recipes | Home. Made. Interest. Thanksgiving wouldn’t be complete with out the Thanksgiving stuffing! 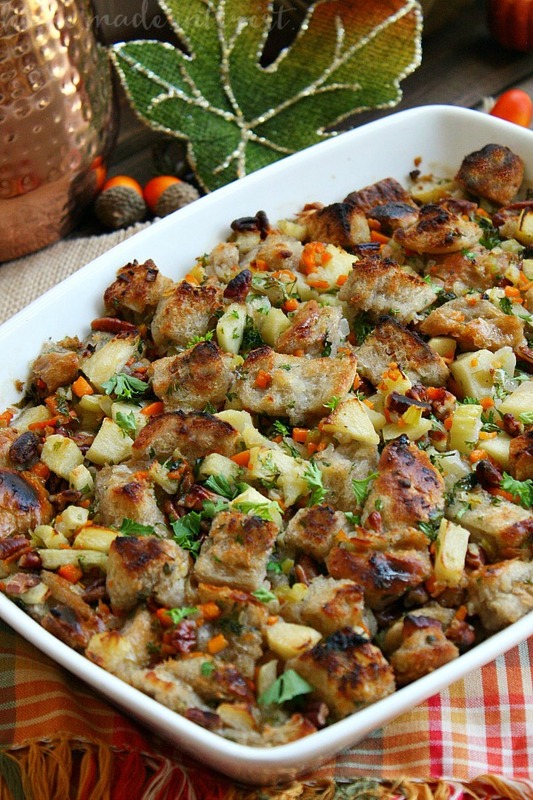 Here are some of the BEST Thanksgiving Stuffing Recipes to wow your guests at Thanksgiving! First, let’s get the whole stuffing vs dressing thing out of the way. Basically the two terms are interchangeable, while stuffing is usually stuffed inside the turkey and baked (hence the name) it can be cooked separately and vice versa for dressing. It really just boils down to where you were raised. As a born and raised Marylander it’s stuffing for me, Kat is a southern girl so she calls it dressing. 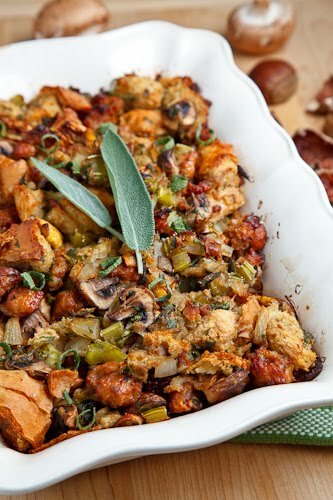 No matter what you call it I think we can all agree that no Thanksgiving is complete without it, so I’ve rounded up 10 amazing looking thanksgiving stuffing recipes, who knows maybe I’ll try something different this year! Note: This post contains affiliate links. This means if you click on something and purchase it we may receive a small commission. Thank you! This Apple Pecan Stuffing recipe is a delicious blend of buttery bread cubes, apples, and pecans. 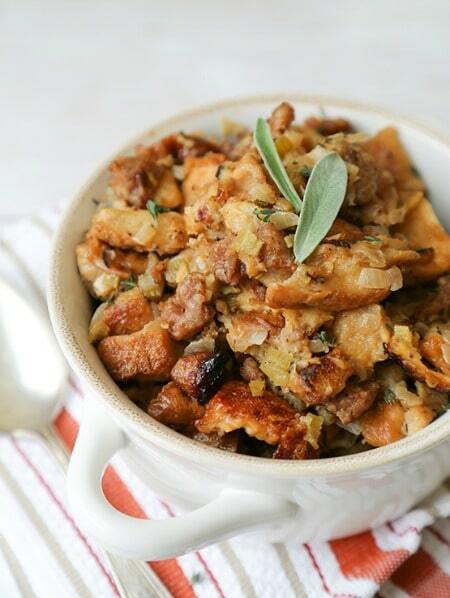 It’s one of the best Thanksgiving stuffing recipes I’ve ever tasted! This Italian Sausage, Mushroom and Chestnut Stuffing is savory and filling. The chestnuts add a touch of sweetness without over-powering the whole dish. 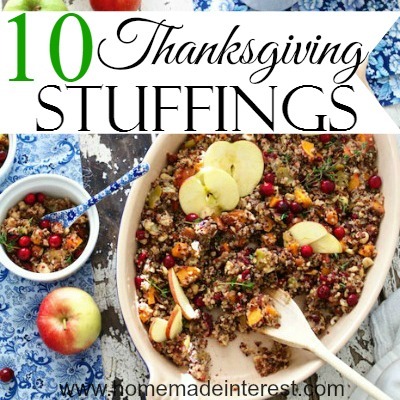 Pin our Thanksgiving Stuffings for later! Just because it’s Thanksgiving doesn’t mean things can’t be spicy. This Chorizo Cornbread Stuffing is made with homemade jalapeno cornbread which packs amazing flavor that the whole family will go crazy for. How about a new twist on a traditional Thanksgiving side. 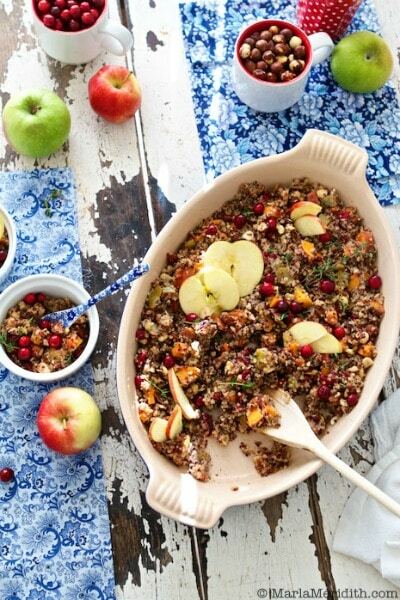 This Quinoa Stuffing with Apples, Sweet Potato and Hazelnuts is a great alternative for people on a gluten free and grain free diet. I use Bob’s Red Mill Quinoa all the time. Sausage, sour dough bread, parsley and sage create a wonderful medley but the real winner in this Sausage, Pear and Sage Stuffing is the slightly sweet and fragrant pear. There’s no denying that bacon makes everything tastes better. 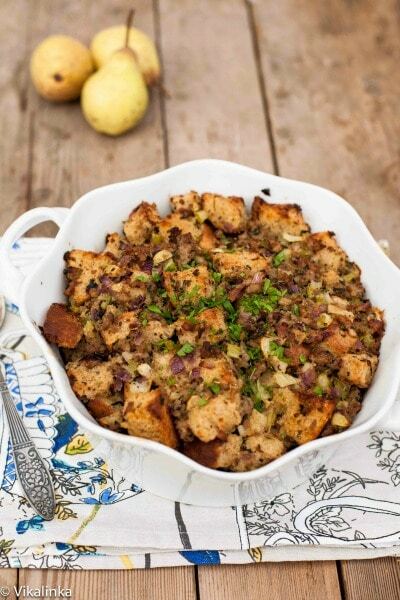 This Onion Bagel and Bacon Stuffing would be great for a Sunday brunch too. 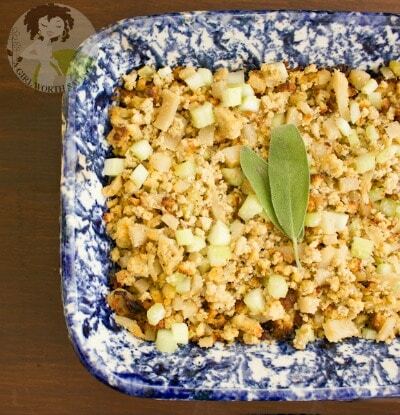 This Wild Rice Stuffing makes an elegant and delicious side dish. The dried cranberries add a touch off sweetness to the pecan and bacon rice mixture. Clean eaters don’t have to feel left out on Thanksgiving. 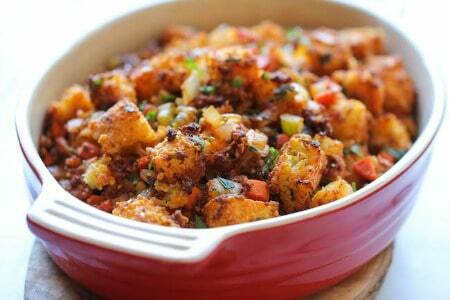 Here’s a Paleo Cornbread Stuffing that everyone will enjoy. Give yourself plenty of time to relax and enjoy spending time with your family before Thanksgiving dinner with this Slow Cooker Stuffing. Here’s my favorite slow cooker. Set it and forget it! This Waffle, Maple and Sausage Stuffing would be perfect for an early Thanksgiving lunch with its breakfast inspired ingredients. Check out our Thanksgiving Recipes board on Pinterest for more ideas on making the perfect Thanksgiving menu. This is a great collection. Thanks for sharing… I think I will have to step it up from a box of Stovetop this year! I had no idea there were so many different stuffings. We’re more traditional, rosemary, sage and thyme with celery and onions. Oh I want to try the wild rice recipe! Thanks so much for the great roundup and for sharing on Show Me Saturday! It’s my favorite part too! 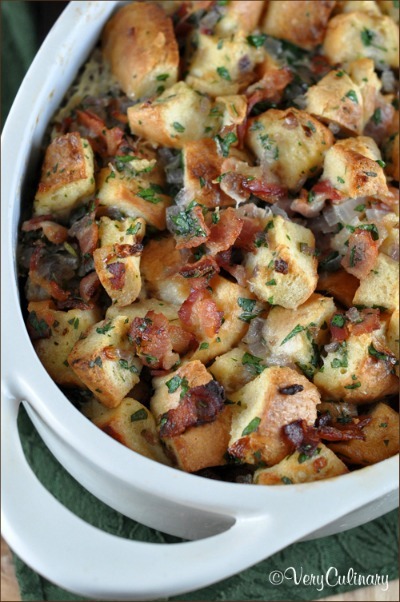 I’ve never made the stuffing for Thanksgiving, but I think I’ll try the slow cooker stuffing recipe this year. Yummy! What a fantastic list! Thanks for sharing on the Monday Funday Party! These all sound so good…i think we need more Thanksgivings in a year!! Thanks for sharing with the Thursday Blog Hop! 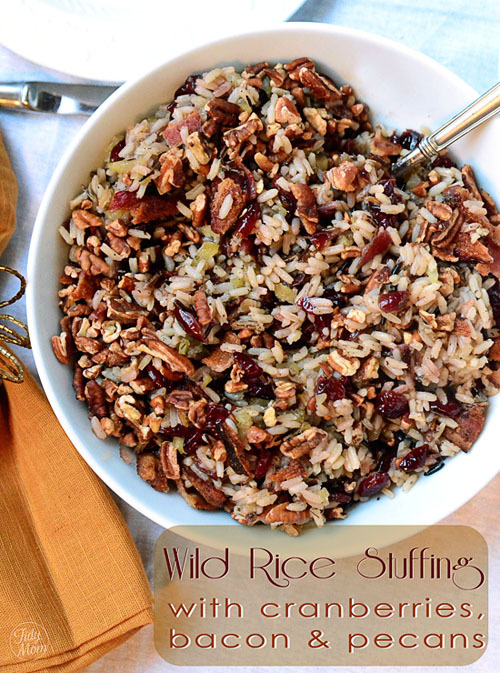 I love wild rice stuffing, and that recipe sounds interesting. Great roundup. Whilst we don’t celebrate Thanksgiving, I can certainly appreciate a great stuffing!! I am tempted to try out that quinoa one…sounds yum!! Hi Lynn, my cornbread dressing gets a little crispy on top as it bakes. In fact if it starts getting too brown I cover it with foil.